While Paya would prefer that our merchants and integrators to whitelist and post to specific domains we realize that some solutions will require an IP address. Please note that IP addresses are subject to change without notice, and we may not post new IP addresses as soon as they are available. Please note that these IP addresses are subject to change without prior notification, we recommend whitelisting by the domain of your post location whenever possible. 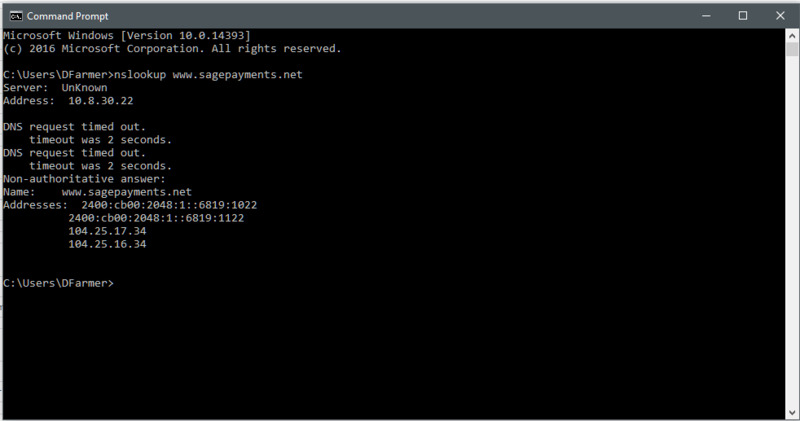 The IP addresses for www.sagepayments.net and gateway.sagepayments.net domains are 104.17.66.105 and 104.17.67.105. The IP addresses for www.sageexchange.com domain are 104.17.22.105 and 104.17.23.105. The IP addresses for va.eftsecure.net 104.20.55.132 and 104.20.56.132. If you are still having trouble what IP addresses you are using to resolve one of the above domains please follow the steps below. If this does not resolve the domain for you, then you may need to flush the DNS. Please use the commands below. from an Administrator Command Prompt. Gateway EMV: What services does my account require to accept EMV?